Anoka County Fair Result Time! 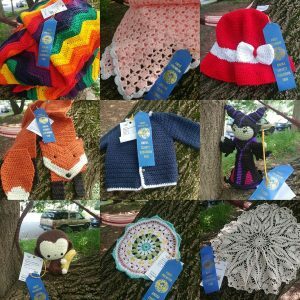 | "A Stitch in Time"
Anoka County Fair Result Time! This is my second year competing as I mentioned in a previous teaser blog post. Last year was more of a rushed throw together what I already had and make a few smaller items sort of thing. This year I started after the previous fair and among my gifts and commissions and other pieces I threw in some category specific projects. The result was 15 pieces to enter myself and a few among the 4 older kids. Echo simply wouldn’t settle down and make anything. Maybe next year. I was actually rather surprised at my results. Ken and I splurged on a date night and went out on the Wednesday and visited the fair (for the first time ever) ourselves. There was “Quebec style poutine” so how could I resist? Seriously, HOW? It has been 4 years since I have had a decent poutine… WORTH IT! Note the stand in the background. 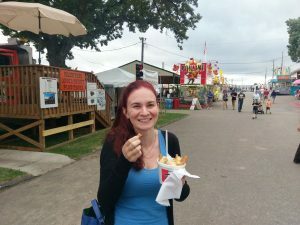 Anyway, Renee had sent me some images from her visit to the fair with her kids days previous but I had balked a finding out all of my results with the hope we would make it there in person. We started with the kids’ stuff where they did relatively well. 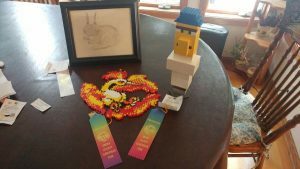 Emanuel only got a participation (which he loves – RAINBOW RIBBON) and Zander and Gavin’s large perler bead didn’t place either. We figure they may have assumed parental assistance… which we DIDN’T… but the rest placed. 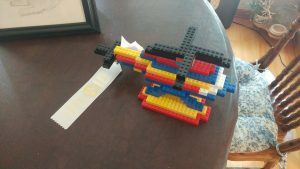 Two lego pieces and a much fought over bunny drawing. Not bad, not bad. 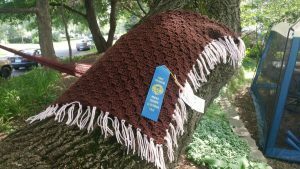 The lovely surprise was Gavin’s shawl taking first in his crochet item category. 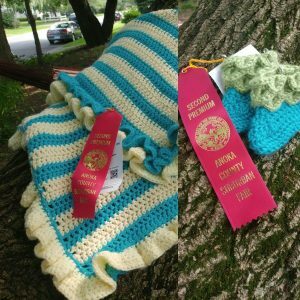 We ran out of steam at the end of this project and didn’t trim our fringe which was the comment on the back of the tag BUT FIRST PLACE!! WOO!! His first COMPLETED project really! Then it was time to wander around, seek out Renee and her kids’ stuff and see how I did. To my surprise 13 out of my 15 entries placed. And, the two that didn’t both had great comments on the back and the statement that it was tough competition. 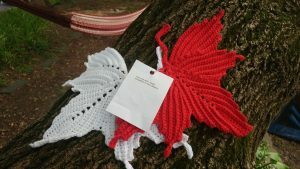 I was not surprised on my maple leaf dishcloths… first off all, red-white and no blue (blue could have put me in the running as patriotic) in a general category that I am sure was full of variety. The other, my purse was much more “purse like” than the ones that placed. I think they were just looking for more… crochet? The winning purse was granny squares and highly colourful. Not my thing. Onto the 2nd place pieces – TWO. And tough categories because they are super popular baby gifts – booties and blankets! Well, I am very proud of both – in fact have gifted versions of both in the past. Again favorable comment on the blanket just… the first place ones had more detail (booties) or were a different style (blanket) BUT certainly something to be proud of. For first place standing alone I had NINE pieces! Woo!!! I cannot tell you how proud I am of them. This is a wonderful cross section of this past year’s creativity. TWO of these pieces will be sent to new homes in the coming weeks – the rainbow ripple blanket which I have blogged about previously) and the evil sorceress doll. Seriously if you have the knowledge and ability and the urge, it is a GREAT pattern and when I got stuck the designer talked me through it on Facebook… check her out! This piece was posted under the storybook character and though the JUDGE didn’t comment on it on the slip, the people working there said MANY of the people who came to see the exhibitions loved it. Let’s see… Monkey – as in year of 2016. I did it bigger than the original and am TOTALLY KEEPING IT. Yup… my monkey, not your monkey, MINE! Ken helped me with the frame work on this little beauty. The designer is doing up all the Chinese Zodiac over the years and I totally plan to go back and do the years she has already designed for eventually. Apparently the biggest suggestion was blocking. We THOUGHT we had that done right, but apparently they figured we could have done better. So back to the drawing board on that one. BUT that is a finishing thing and not a crucial crafting issue. So there is less worry about time and such. I did make a second of the wedding gift from this summer – that would be the off white doily. Crocus doily. Other than that… well I am very proud of these 9 pieces! Super proud! And now for the BIG surprise to me… 2 plus 2 plus 9 equals 13… so two more to come… and both of those first place PLUS Reserve Best of Show. Now no one could completely explain how that was chosen or anything. But what it does mean is that these are pieces that stood out to the judge. What made me laugh is that I tossed that hat in there on a whim. 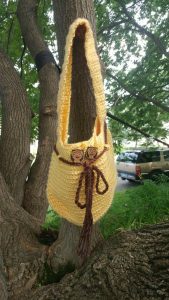 I had made it after I made Emanuel’s for Halloween this past year and still had enough yarn left over for a second smaller version. Go figure! So all in all… we did good. We placed, we showed off skills that we will continue to nurture and next year will have a whole new batch of creative ventures to exhibit! I know I am already brainstorming how I can make newer and harder items in duplicate – one to gift/sell/etc and one to show… why not? Just getting the judge’s feedback made it all worthwhile!! 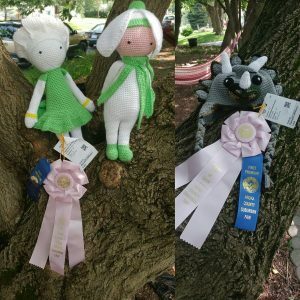 And now I have some ribbon winning pieces to sell if I ever get the chance to have that craft table I want to try out. Or gift of course! EXCEPT FOR MY MONKEY! That little guy is already on my bookshelf guarding his monkey! Pingback: Happy Year of the Rooster! | "A Stitch in Time"
More than 2 years (hard to believe it has been that long!) after it arrived here, that Rainbow Ripple blanket is still getting daily use! Whatever those judges said you did wrong, to put it simply, THEY were wrong!! It has seen me through everything from common colds to near pheumonia with a couple of ear infections, a skin infection, and a bout of strep throat thrown in the mix so has been washed many times. The blanket has held up perfectly and is still just as bright and beautiful as the day it arrived. I absolutely LOVE it still and I absolutely LOVE you, too! !